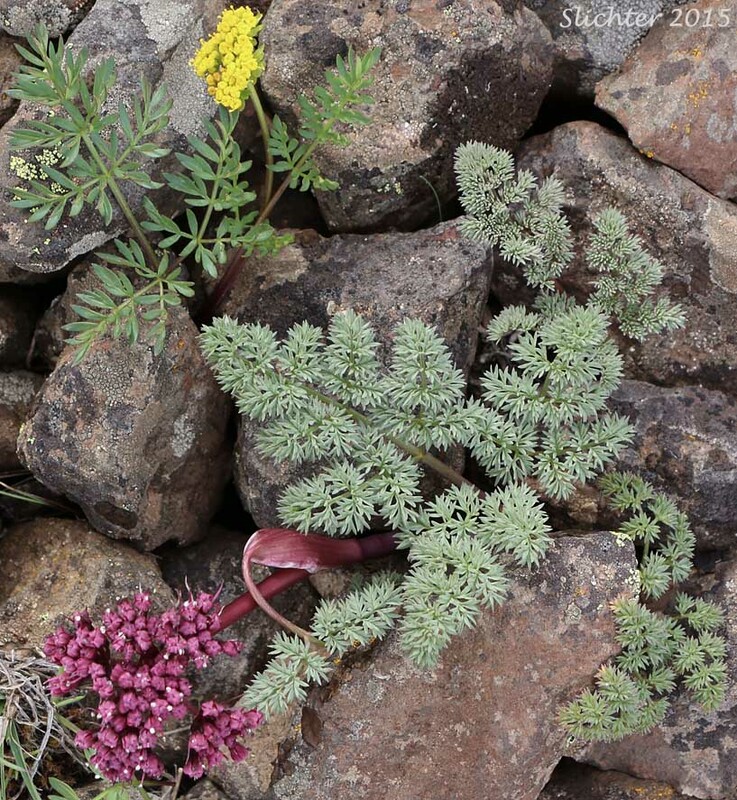 Cous (Lomatium cous) and John Day Valley Desert Parsley (Lomatium minus) seen in bloom along US Highway 97 west of Shaniko, Oregon..........March 10, 2015. Columbia Desert Parsley, Columiba Gorge Desert Parsley: Lomatium columbianum - A species of the Columbia River Gorge, it can be found up the Klickitat drainage in south-central Washington and on the eastern foothills of the Cascades in Wasco county, Oregon. Klickitat Desert Parsley, Klickitat Lomatium: Lomatium klickitatensis (Synonym: Lomatium grayi in part) - Distinct, pungent odor of foliage. Plants are larger, more rounded in form with longer leaf segments than similar L. papilioniferum. Endemic to the Columbia River Gorge near The Dalles, OR and adjacent Klickitat County in Washington. Common Lomatium, Spring Gold: Lomatium utriculatum - A coastal species, a collection (mis-identified?) seems to have been made in northeastern Washington.